NETWORK FINALS: The special Prince-centric 20/20 went down 0.1 in final numbers. In addition, a post-baseball adjustment for CW lowered both THE VAMPIRE DIARIES and the rerun of the CONTAINMENT pilot by 0.1. 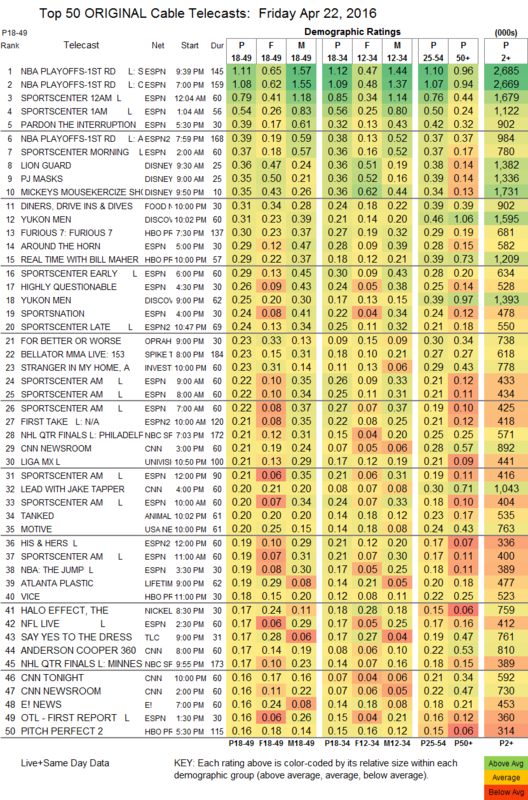 CABLE HIGHLIGHTS: ESPN had the NBA PLAYOFFS on Friday, giving it the night’s top 2 slots at 1.11/1.08. The Disney corporation actually controlled all Top 10 slots, thanks to ESPN’s regular daily programming and an additional (Atlanta vs. Boston) NBA game on ESPN2 at 0.39, plus a trio of Disney Channel hits: the morning’s LION GUARD and PJ MASKS at 0.36/0.35, and a 10-minute slice of MICKEYS MOUSEKERCIZE in primetime at 0.35. Food Network’s DINERS, DRIVE-INS & DIVES was at 0.31. Discovery aired 2 hours of YUKON MEN at 0.25/0.31, compared to last week’s 0.32. HBO’s REAL TIME WITH BILL MAHER gained 0.02 to 0.29, and VICE fell 0.02 to 0.18. OWN’s FOR BETTER OR WORSE ticked down to 0.23, Spike’s BELLATOR MMA was at 0.23. USA’s MOTIVE gained 0.02 to 0.20. Lifetime’s ATLANTA PLASTIC lost 0.03 to 0.19. TLC’s SAY YES TO THE DRESS rose 0.02 to 0.17. Bravo’s THE PEOPLE’S COUCH upticked to 0.14. We’s KENDRA ON TOP fell to 0.14/0.14 from last week’s 0.19/0.16. The finale of Comedy Central’s TIME TRAVELING BONG slid another 0.08 to 0.14. Cinemax’s BANSHEE had a 0.05 bump to 0.13. 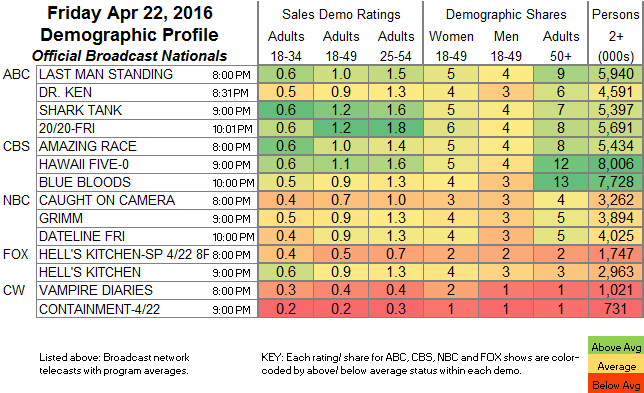 Syfy’s WYNONNA EARP lost an ugly tenth, leaving it at 0.08.